Waking up to the sight of Phoebe and Benji sleeping in each other's arms was a pleasant surprise. 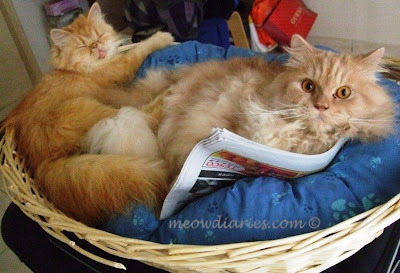 It was the first time these two slept in the basket together for it's usually Phoebe who conquers the bed. Her brothers hardly sleep in this comfy paw cushion but Phoebe loves it. She looks exhausted in this picture, which got me wondering what naughty fun and games my kitties were caught up in last night while I was sleeping! Chubbs was already up and about when I went outside. He is the oldest of my cats and the most reserved and well-behaved. Chubbs doesn't fuss much and he's hardly ever naughty. He is also very courteous especially when it comes to eating and doesn't mind letting Benji and Phoebe have their share first while he patiently waits his turn. I sometimes wonder what my cats are up to when I am asleep or out of the house. Wouldn't it be cool to see their naughty antics when Master is away? Come to think of it, I should have bought the Hidden Camera that we saw in the big toy store in Japan. Hidden inside an air freshener bottle, the little device would be able to capture my cat's every move! I could set it up at a strategic place and spy on my cats. My ever vigilant and responsible Chubbs would probably be roaming the rooms; ensuring everybody is safe and sound. And I bet Phoebe and Benji would be busy playing all night long; chasing each other and making the mess I'd wake up to the next day! Who knows what else the hidden camera might capture? What do you think of using a hidden camera by the way? Would you consider using one? If I could afford it, I don't mind getting one to spy on my cats! But that's about it; I wouldn't use a hidden camera for any other purpose other than entertainment. It would be interesting to leave the camera on while we're out so we can enjoy a nice home video of the cats later; see what naughty tricks the kids are up to when Master and B are not around! Smile kitties! the second pic is Chubbs?? Yes Mon, the second pic is Chubbs… he he so can tell them apart edi or not? LOL! Morning sweetie! I just woke up lah :-P :-P didnt drop and click at all yesd; so busy!!! You too dearie? The one I saw at the toy store in Tokyo, u can actually tie around their neck so we can see where they go at night! Cool eh? hahah.. that would be awesome... can see what they see.. haha.. kalau Smokey mesti hunt for Mr L!! hehe.. so cute lah lah Pheebs and Benji.. so caring...! Aiyooooo don wan la to mensi Mr. L! I don wan to see my kids hunting for Mr. L while I’m sleeping he he! Yeah! Masa baru bangun, they were huggy wuggy like dat, quickly snapped pics la ha ha! My emoticons explain the Chopping Feeling. Lol!! A hidden Camera?, later will find out that Benji and Phoebe are probably busy blogging using Master Pink Lappy. tee hee. Catching up gossips. As if "Master!!.. stop taking our picture." Lol! Hahahah. ok no Mr L! So cute lah.. I love it when they so lovey dovey kan?! So sad.. no offers from RM lah! How I wish my kitties can do the housework!! Lol! 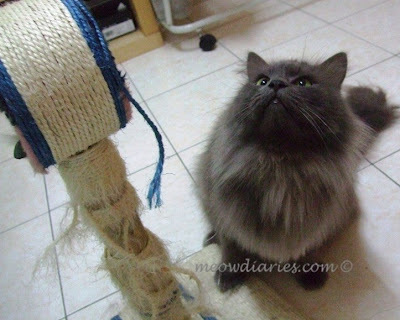 I oso wish my kitties can do the housework for me he he he! Don be sad dearie, u kena stalk RM! Like MPG, this month got 2 I think from RM, but hafta stalk la lol! LOL! So far so good and I still have my lizzie spray just in case! with fluffy fur.. I am sure they are best at mopping the floor. Lol!! Ahaha... I do agree. What Heaven (tak nak guna Hell) of a brave cat it is. And look who has a brand spanking new blog that is simply fantastic!! Congratulations!! Oh I have missed you and everyone so much!! Your babies are just adorable!! I will pick up your badge and add it to my site in honor of your new blog! Thank you for the compliment Kim, meow!